A woman approached me on Sunday about visiting her rapidly ailing father. I asked about him, but she quickly shifted the conversation to her caregiving mother, who is constantly attending to his every need. She is exhausted. Emotionally spent. As she spoke, tears flowed, not only out of compassion but also from frustration. Is he doing all he can to get better? Why does she have to endure this? 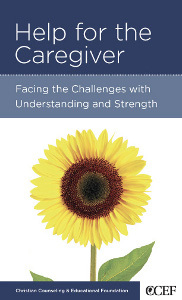 How can she support her caregiving mother from so far away? Four years ago, my mother was diagnosed with Parkinson's disease. The diagnosis confirmed what her children had long suspected (including my doctor brother and doctor sister-in-law) but my father was the last to find out. It has been an uphill battle for him ever since. Just slightly behind to downward trajectory of my mother's condition. Trying to keep up with her ever-growing needs, we adult children would visit her whilst encouraging and consoling him. Early during this journey, I handed my father a little booklet that had caught my eye and resonated with what I felt for my Dad. Caregiver - that is the role that had now been thrust upon my father. And while many prayed and wept for my mother, his adult children knew, "This is going to be so hard on Dad. How can we make sure he seeks and gets help?" Linked here is the booklet that CCEF has translated into blog form. You can access this for free and perhaps pass it on to someone you love who is giving care to another in need. Remember: They might feel guilty, embarrassed, or ashamed for looking after themselves, so make sure you help do it for them and affirm your support.